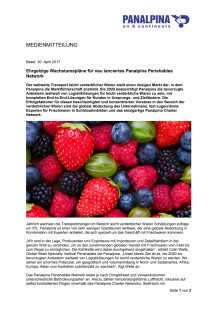 The worldwide transport of perishables constitutes a huge market where Panalpina is aiming to become the market leader. By 2020 the company aims to be the preferred global supplier of perishables logistics, offering customers in both origin and destination countries complete end-to-end solutions on a global scale. The success factors for this accelerated and concentrated push into perishables are the company’s global coverage, dedicated perishables experts in key markets and the unique Panalpina Charter Network. 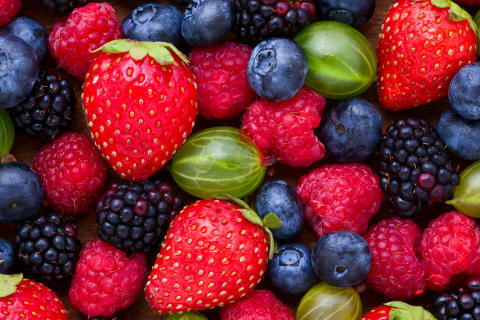 Transported volumes in the perishables industry are growing year on year by an estimated 5%, and Panalpina is one of only very few freight forwarders worldwide that can combine global coverage with experts dedicated to the perishables business. 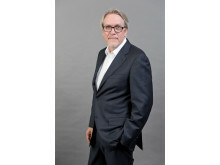 “We have the ability to connect growers and exporters to importers and retailers all over the world to enable the increasing global trade of perishables from field to shelf and to ensure product integrity along the complete cool chain,” explains Colin Wells, global head specialty vertical perishables at Panalpina. “Our clear ambition is to become the preferred global supplier of perishables logistics by 2020. We see enormous potential to substantially grow our geographical footprint and volumes in North and South America, Africa, Europe, Asia and Australia,” adds Wells. The Panalpina Perishables Network provides a choice of multiple modes of transport depending on urgency and shipment size. These include temperature-controlled air freight, also on fully-controlled flights within the Panalpina Charter Network, ocean reefer freight, temperature-controlled road and courier services, or any combination of these modes of transport.Panalpina’s specialists ensure a quality service with optimum mode of transport and speed to market, full supply chain visibility and global regulatory compliance. 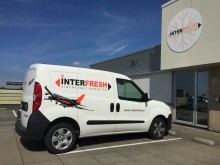 “What sets us apart from the competition is our global reach, our unparalleled air freight charter expertise and capabilities; combined with dedicated, highly experienced perishables experts. For specific markets and perishables, we will work closely with qualified agents that bring additional local expertise at origin and destination to the table. 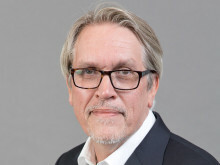 It is a winning formula that truly allows us to offer end-to-end solutions on a global scale where shipments arrive in the right place, at the right time and in peak condition,” says Wells. The growth perspectives and the global nature of the perishables business make it attractive for Panalpina. The company’s perishables activities originated in Latin America, and were then extended to Europe and Africa. The Panalpina Perishables Network will span 15 key countries at first, with a clear plan to double the network to cover all regions. Colin Wells and his team are building the Panalpina Perishables Network. Der weltweite Transport von Frischwaren stellt einen riesigen Markt dar, in dem Panalpina die Marktführerschaft anstrebt. Bis 2020 beabsichtigt Panalpina die bevorzugte Anbieterin weltweit von Logistiklösungen für leicht verderbliche Waren zu sein, mit kompletten End-to-End-Lösungen für ihre Kunden. Die Erfolgsfaktoren: globale Abdeckung, Experten für Frischwaren und das Panalpina Charter Network.